Nearly half of the respondents in Australia said that the risk of payment delay and default from B2B buyers has increased over the past six months. One in five respondents rated it as “significant”. Just over 78% of the survey respondents in Australia reported having offered trade credit terms to their B2B customers over the past year. This response rate is notably below that of Asia Pacific (91%), and is the lowest in the region. This would suggest that businesses interviewed in Australia are the most inclined in Asia Pacific to request payment on cash, cash equivalents or on terms other than trade credit, from their B2B customers. This more selective approach to the use of trade credit in B2B transactions is typical of Japanese respondents as well. There does not appear to be a significant difference in the use of trade credit insurance with domestic compared to foreign B2B customers of Australian respondents. This is in contrast to the survey pattern, which shows that, on average, respondents in the region are notably more inclined to sell on credit to domestic than to foreign B2B customers. Domestically, credit-based sales in Australia average 46.5% of the total value of the local sales to B2B customers. This is below the 50.6% average for Asia Pacific. 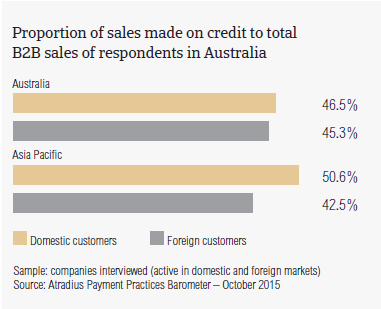 Credit-based sales to foreign B2B customers average 45.3% of the total value of Australian respondents exports. This figure is above the average for Asia Pacific (42.5%). The difference between the domestic and the foreign proportion of credit-based sales in Australia is the smallest of the countries surveyed. This suggests that Australian respondents have the most uniform perception of payment default risks arising from domestic and foreign B2B trade of the Asia Pacific countries surveyed. Over the past year, the average proportion of domestic B2B sales on credit in Australia decreased slightly, by an average of nearly 3 percentage points, which is in contrast to the average 3.2 percentage point increase recorded in Asia Pacific over the same time frame. The proportion of credit-based sales to foreign B2B customers, conversely, increased by an average of 5.8 percentage points, in line with the average 5.5 percentage point increase at regional level. This increase in Australia may be a reflection of the foreign trade opportunities created by the rapid economic growth in Asia, and the recent conclusion of various free trade agreements. Respondents in Australia set the shortest payment terms for domestic and foreign B2B customers, both averaging 20 days from the invoice date. These terms are well below the 33 days average for Asia Pacific, and are the swiftest in the region. This highlights that suppliers in Australia place a stronger emphasis on timely payment of invoices from B2B customers than their peers in the region do. Compared to the same survey period one year ago, the domestic average payment term in Australia increased slightly (by an average of three days). Payment terms extended to foreign B2B customers, in contrast, remained unchanged. 93.8% of Australian respondents reported having experienced invoice late payment over the past year. This response rate, which has remained stable and unchanged since the last survey period, is above the 90.2% of respondents in Asia Pacific overall. Nearly half of the survey respondents in Australia expressed the opinion that the risk of payment delay and payment default from B2B customers has increased over the past six months. One in five respondents, in particular, rated this increase as “significant”. 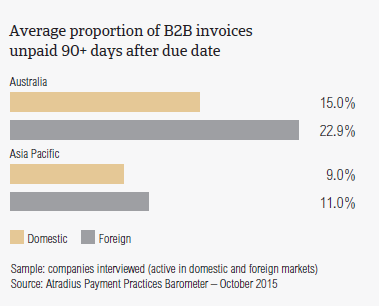 Foreign B2B customers of Australian respondents paid invoices late almost as often as did domestic customers. In terms of value, conversely, the average proportion of foreign invoices paid late appears to be much higher than that of domestic invoices paid late. On average, 63.1% of the total value of foreign, compared to 49.1% of the total value of domestic B2B invoices remained unpaid at the due date (Asia Pacific: 45.2% foreign and 44.8% domestic). The foreign average for Australia, is significantly above the foreign average for Asia Pacific and is the highest in the region. 18% of the total value of Australian respondents’ B2B invoices remained unpaid 90 days or more past the due date (average for Asia Pacific: 10%). The proportion of long outstanding invoices from foreign B2B customers, in particular, is the highest of the countries surveyed. However, despite the high proportion of long overdue invoices observed in Australia, at 18 days, the average Days Sales Outstanding (DSO) of Australian respondents is unexpectedly the shortest in the region (the regional average is 35 days). This figure is likely to reflect the stringent credit terms and the higher percentage of non-credit based sales observed earlier on. Domestic B2B customers of Australian respondents make their past due payments, on average, 35 days after the due date. Foreign past due invoices are paid by customers within an average of 51 days past due. Both figures are significantly above the regional averages (25 days domestic and 28 days foreign). On average, B2B suppliers in Australia receive payment on overdue domestic B2B invoices, around 55 days after invoicing, and on foreign invoices after about 71 days. Over the past two years, both the average domestic and foreign payment delay figures in Australia varied widely. The significant increase recorded this year brought the rate of domestic and foreign overdue payments to levels markedly higher than in 2013. Domestically, the variation in timing of customers’ payments likely stems from the still struggling economy and difficult business environment. The foreign payment delay, in contrast, largely reflects the longer average payment terms common in the countries of the respondents foreign trade partners. The various reasons for customers’ slow payment will be commented on further in this report (see below “Key payment delay factors”). Carrying long overdue receivables, besides exposing businesses to a higher risk of payment default implies financial and administrative costs. If these costs are not offset by higher sales revenues, they are likely to eat into profit margins. Higher sales in turn are unlikely to be achieved using a restrictive credit policy and tight payment terms. Consequently, it is essential for businesses, for which more lenient payment terms are not an option, to maintain steady sales patterns. Given the tight payment terms observed in the country, it comes as no surprise that most of the respondents in Australia consider a likely drop in sales volume to be the biggest challenge to business profitability this year (21.9% of respondents in Australia, versus 17.4% in Asia Pacific). This is in contrast to the general opinion of businesses interviewed in the region, who reported that cost containment is the biggest challenge to profitability in 2015. Above the survey average is also the percentage of Australian respondents who consider bank lending restrictions challenging this year (nearly 10%, versus 6.6% for Asia Pacific). The majority of respondents in Australia (two in five) indicated that late payment by domestic B2B customers is mainly attributable to liquidity issues. This quite sizeable percentage, which points again to the country’s challenging economic conditions, is slightly below the 46.3% average recorded in Asia Pacific. Above the 13.9% survey average is the 19.1% percentage of Australian respondents stating that late payment on domestic B2B sales was most often due to the invoice being sent to the wrong recipient. Late payment from B2B customers abroad was reported to be due to a larger variety of reasons. For one in four respondents alike, slow invoice payment from foreign customers is mostly due to the formal insolvency of the buyer and to the fact that the invoice was sent to the wrong recipient. Around one in three respondents reported that late payment on foreign B2B invoices is most frequently attributable to incorrect information on the invoice, or to the non-correspondence of the goods delivered or services provided to what was agreed in the sale contract. The proportion of B2B receivables, reported by Australian respondents as uncollectable averages 2% of the total credit sales value in the country. This is in line with the survey average. Consistent with the survey pattern, domestic write-offs outweigh foreign ones. This may be explained by the relatively greater difficulty experienced by respondents in collecting foreign trade debts than domestic trade debts. Uncollectable domestic and foreign B2B receivables were primarily reported as coming from the agriculture, chemicals, construction, consumer durables, and business services sectors. For most of the respondents in Australia (around 51%), B2B receivables went uncollected either due to the customer being bankrupt or out of business, or to the failure of the collection attempts. This compares to 54.4% of respondents in Asia Pacific in relation to the customer being bankrupt, and to 38.6% of respondents in relation to the failure of the collection attempts. The aging of the trade debt, and the circumstance in which the customer could no longer be located, were the most frequent reasons for receivables to be written off, according to 29.8% and 37.7% of the respondents in Australia respectively. Survey respondents in Australia reported granting trade credit terms mainly to B2B customers belonging to the agriculture, chemicals, construction, consumer durables, food and services (financial and business services) sectors. The longest payment terms, averaging 35 days from the invoice date, are given to B2B customers in the financial services sector. Domestically, B2B customers in the chemicals sector generated the highest levels of past due payments. Around three-fifths of the total value of B2B invoices is paid late, with an average payment delay that is twice as high as the country average. 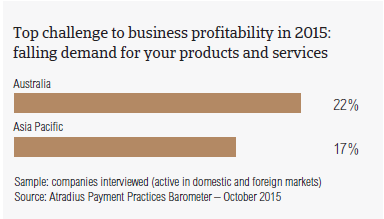 Late payment from foreign B2B customers occurred most often in the food sector. Around three-fourths of the total value of B2B invoices was classified as overdue, with a payment delay averaging 56 days. The most often reported reasons for domestic payment delays in the chemicals sector (around 35% of respondents) were liquidity issues, or reasons attributable to the payment procedure and to the invoicing process. Foreign buyers in the food sector (half of respondents) delay invoice payment most often due to liquidity issues, to the formal insolvency of the buyer, or to reasons stemming from the payment procedure and to the invoicing process (around two in five respondents each). Around four in nine respondents in Australia said that they do not expect any change in the payment behaviour of domestic B2B customers over the coming 12 months. Nearly 50% anticipate a worsening, particularly in the chemicals and construction sectors. One in four respondents do not anticipate any marked variation in the payment behaviour of B2B customers abroad over the same time frame. Half of the respondents anticipate a deterioration of customers’ payment practices in the food sector. For more insights into the overall payment practices in each of the countries surveyed in Asia Pacific, please refer to the respective country reports which form, along with the regional report, the 2015 edition of the Atradius Payment Practices Barometer for Asia Pacific. Free download on atradius.com.